The quickest and easiest way to get from one Hawaiian island to another is on board an airplane. 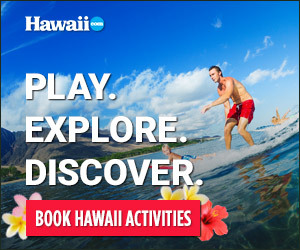 Booking through an O‘ahu discount provider is a painless alternative to flying direct; these trips usually include a guided bus tour and sometimes, overnight accommodations. Each neighbor island has its own signature geographic and cultural characteristics, and each is distinctly different from O‘ahu. MAUI, “The Valley Isle,” is teeming with mountainous climes and scenic road adventures. If you’re a hiker or biker, this is an excellent option for you. Thrill-seekers should know, it’s home to the most zipline outfits of all the islands. many a Hollywood film crew over the years. The BIG ISLAND (or HAWAI‘I ISLAND) draws many for Madame Pele’s “light show,” that is, the gurgling lava that oozes from Kilauea and is currently pouring into the sea. Of course, being a large island, there’s much more to do: tropical rainforests, highland deserts with grazing cattle, cowboy country and a plethora of diving spots in some of the deepest waters off Hawai‘i. Whether for a half-day or a weekend excursion from your “big city” adventure, take a trip to O‘ahu’s backyard with a visit to the Neighbor Islands.